You can customise your shift start and end time rounding, in the Time & Attendance settings. Go to Settings > Company Settings > Staff Permissions > Edit Profile > Time & attendance. Rounding can be changed to round up or down to the nearest rostered start or end time using 5, 10, 15 or 30 minute increments in 4 different instances, or you can set to not round at all. Some companies use shift rounding to more cleanly align timesheets with rosters, or to use rounding to minimise budget variance from staff arriving before they are rostered and starting early or staying back later than rostered without manager approval. Managers will still be able to make changes to reflect what actually happened that day, compared with the roster, reviewing start and end times that even once rounded are different than rostered start and end times. 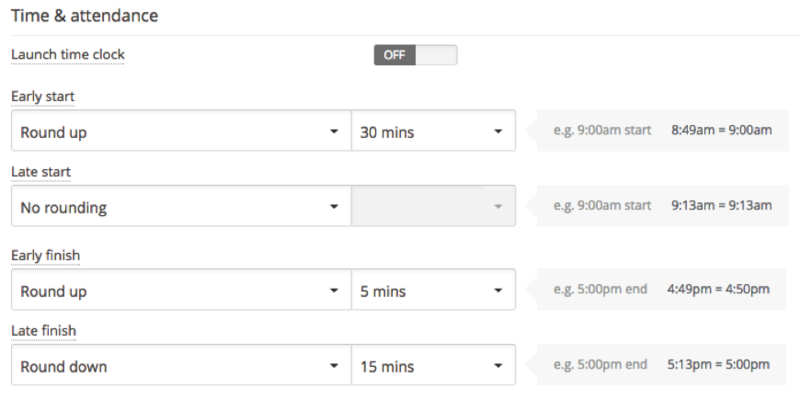 These settings are managed in the Staff Permissions profiles, so you could create different profiles for Staff and Managers if required.